Introduction: This is an excellent opportunity for outstanding and motivated individuals to access one of the most comprehensive population-based HIV surveillance and genomics datasets in the world at the Wellcome Trust Africa Centre for Health and Population Studies based in KwaZulu-Natal, South Africa. 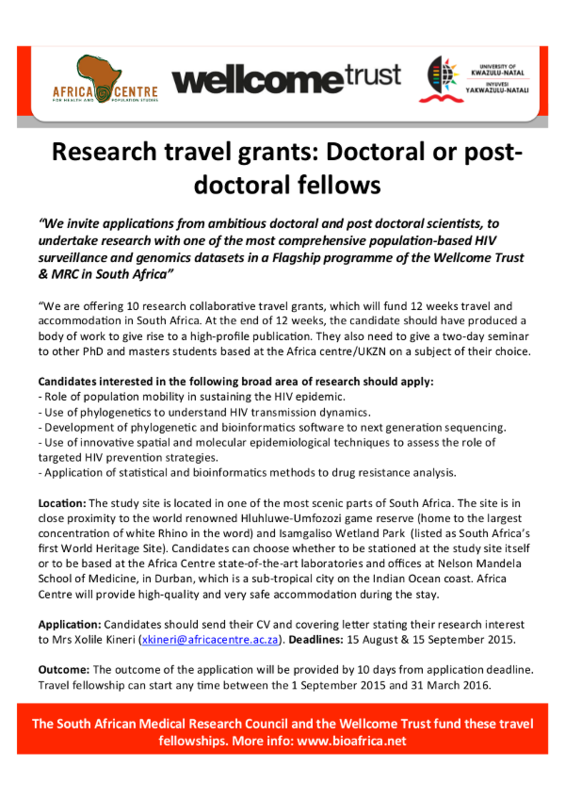 We are offering 10 research collaborative travel grants, which will fund 12 weeks travel and accommodation in South Africa. At the end of 12 weeks, the candidate should have produced a body of work to give rise to a high-profile publication. They also need to give a two-day seminar to other PhD and masters students based at the centre on a subject of their choice. 1)	Role of population mobility in sustaining the HIV epidemic. 2)	Use of phylogenetics to understand HIV transmission dynamics. 3)	Development of phylogenetic and bioinformatics software to next generation sequencing. 4)	Use of innovative spatial and molecular epidemiological techniques to assess the role of targeted HIV prevention strategies. 6)	Application of statistical and bioinformatics methods to drug resistance analysis. The topics are not comprehensive and other topics in line with the research agenda of the Africa Centre will be considered. Datasets and scientific output: The Africa Centre boasts state-of-the-art data collection facilities and has been collecting detailed longitudinal information on a population of 90,000 since 2000. All this longitudinal information is linked to a comprehensive geographical information system and next generation sequencing datasets, including over 500 HIV-1 whole genomes. Researchers at Africa Centre had used this data to produce over 600 publications, including a number of high-profile publications in Science, Nature, NEJM, Lancet and PLoS Medicine (see a list at the end of this email). Location:The study site is located near the town of Mtubatuba in one of the most scenic parts of South Africa. The site is in close proximity to the world renowned Hluhluwe-Umfozozi game reserve (home to the largest concentration of white Rhino in the word) and Isamgaliso Wetland Park (listed as South Africa?s first World Heritage Site in December 1999 in recognition of its superlative natural beauty and unique global values). Candidates can choose whether to be stationed at the study site itself or to be based at the Africa Centre state-of-the-art genomics and bioinformatics laboratories in the city of Durban, which is a sub-tropical city in the Indian Ocean coast. Africa Centre will provide high-quality and very safe accommodation during the stay. Renew: Successful candidates who produce high impact publications after the initial visit can apply to have the travel grant renewed for another 12 weeks. They will also be supported to apply for fellowships to forge long-term collaborative research links. Application: Prospective candidates should send their CV and covering letter stating their research interest to Mrs Xolile Kineri (xkineri@africacentre.ac.za). Deadline: 15 August 2015 & 15 September 2015. Evaluation process: Candidates will be evaluated based on their CV, motivation letter and the scientific question proposed. Outcome: The outcome of the application will be provided by 10 days from application deadline. Travel fellowship can start any time between the 1 September 2015 and 31 March 2016. Funding will be provided by the South African MRC Flagship program at Africa Centre and UKZN. All publications arising from this travel fellowship should acknowledge the funding source. - Tanser F, Hosegood V, Barnighausen T, Herbst K, Nyirenda M, Muhwava W, Newell C, Viljoen J, Mutevedzi T, Newell ML. Cohort Profile: Africa Centre Demographic Information System (ACDIS) and population-based HIV survey. Int J Epidemiol 2008;37(5):956-62. - Pillay D et al. PANGEA-HIV: phylogenetics for generalised epidemics in Africa. Lancet Infect Dis. (2015), 15(3):259-61. - Tanser F. et al. High coverage of ART associated with decline in risk of HIV acquisition in rural KwaZulu-Natal, South Africa. Science (2013), 339(6122):966-971. - Chevenet F et al. Searching for Virus Phylotypes. Bioinformatics (2013), 29 (5):561-570. - Goedhals D et al. The tainted milk of human kindness. Lancet (2012), 380:702. - de Oliveira T et al. Public Database for HIV Drug Resistance in southern Africa. Nature (2010), 464(7289):673. - de Oliveira T et al. Molecular epidemiology: HIV-1 and HCV sequences from Libyan outbreak. Nature (2006), 444(7121):836-7.